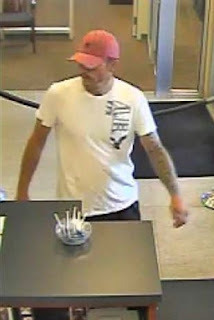 Charleston police searching for suspect after West Ashley bank robbed | Crime Stoppers of the Lowcountry: 554-1111 | 1-888-CRIME-SC | Anonymous tips earn cash rewards with Crime Stoppers of the Lowcountry. CHARLESTON S.C. (WCIV) — Charleston police responded to South State Bank on Savannah Highway Wednesday morning for reports of a robbery. According to CPD officials, the bank was robbed around 10:35 a.m.
Officers are still searching for the suspect. They say he is a white man, believed to be 30-45 years of age. He has a "chinstrap beard." Surveillance video shows him wearing a bright red hat and a white shirt with black writing. They say he's about 6-foot tall. 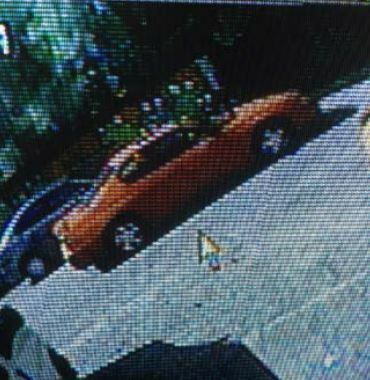 Police say he left the scene in an orange Chevrolet Monte Carlo (view photo). If anyone knows anything about this or any other crime, they are asked to call Crime Stoppers at 843-554-1111 or the Charleston Police Department at 843-743-7200. We will update this story when more information becomes available.